I took this last weekend when I decided to go for a walk around my neighborhood and test out the 55-300mm AF-S VR G lens I purchased with my camera. The point was to familiarize myself with the camera, the optics, and their combined capabilities before I take them out for some heavier duty shooting this July 4th. I composed this shot’s predecessor mainly to see how tight a depth of field I could manage at 300mm, without really thinking of the artistic potential it might have. The setting was a neighbor’s lawn, which was slightly curved as it was on a hill. 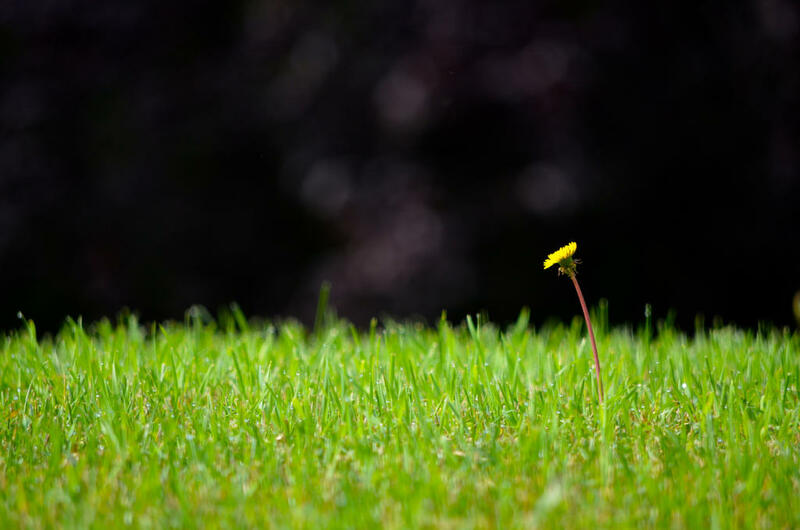 I crouched down so that a cluster of dandelions would be stand out over the rest of the lawn and zoomed all the way in. I didn’t even bother taking a particularly stable stance, I just hoped the abundance of daylight and vibration reduction system on the lens would make things work. After the first shot, I realized I just had to take another shot (or five). To get such a dark background, I maneuvered around so that a Japanese maple tree was situated behind the scene. With a little post processing by adjusting levels, I could easily crush the blacks to make the dandelion stand out even further than just by depth of field alone. I took about five shots, refocusing each time so that I could guarantee that one shot would be perfectly focused. With the given aperture and zoom, being off by even a few inches would defeat the entire composition of the picture. What I like to take away from this picture is that you never know where your next favorite piece will come from. Almost anything can be turned into a creative piece with enough thought and luck. You just have to keep your eyes open.